For fans of Andrew Smith and Frank Portman and the movies Election and Ferris Bueller's Day Off comes a hilarious and satirical novel about the highs and (very low) lows of the electoral process, proving that the popular vote is the one that matters most. Stacey Wynn was the clear front-runner for Lincoln High student council president. But then French-Canadian transfer student Julia Romero entered the race...and put the moves on Stacey's best friend/campaign adviser, Brian. Stacey also didn't count on Tony Guo, resident stoner, whose sole focus is on removing the school's ban of his favorite chocolate milk, becoming the voice of the little guy, thanks to a freshman political mastermind with a blue Mohawk. Three candidates, three platforms, and a whirlwind of social media, gaffes, high school drama, and protests make for a ridiculously hilarious political circus that just may hold some poignant truth somewhere in the mix. Gordon Jack always wanted to be a writer. In third grade, he put that on his What I Want to Be When I Grow Up list, just behind astronaut and professional dog walker. While working toward this goal, he had jobs as an advertising copywriter, English teacher, librarian, and semiprofessional dog walker. 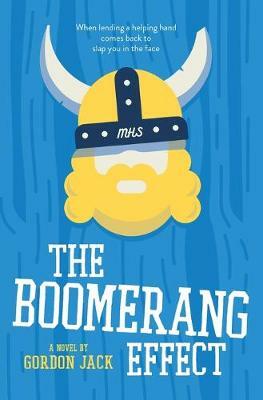 The Boomerang Effect is his first novel. He lives in San Francisco with his family. Visit him online at www.gordon-jack.com or on Twitter @gordojack.